How Effective is Real Estate PPC? Today’s digital marketing scene offers businesses a rich assortment of options for promoting their brand. Among the most used digital marketing platforms are pay-per-click (PPC) or paid ads, whether it’s in the form of text ads, banner ads or sponsored / promoted social media ads. The real estate industry is one of the most competitive industries today. The combination of increasing incomes, fast developing communities and competitive real estate prices has made the industry ripe for the buyers’ market. Increasing market reach and visibility requires more creativity now – traditional marketing isn’t enough anymore, and so real estate companies are using digital marketing as an extended platform. But how effective is digital marketing for real estate, and more importantly, how effective is real estate PPC? Historical data from various sources show that real estate PPC is, in fact, very effective. PPC statistics tracking blog PPCStatistics.com reported late last year that the success rate of real estate on Google’s Display Network reached an average conversion rate of 1.49%. The average for all industries is 2.70% for search results and 0.89% for display ads, making real estate sit comfortably as one of the highest converting industries using paid advertising. Smart Insights, meanwhile, also reported the same figure for real estate display ads. In addition, they revealed that real estate’s search result conversions for AdWords was at 4.40%. 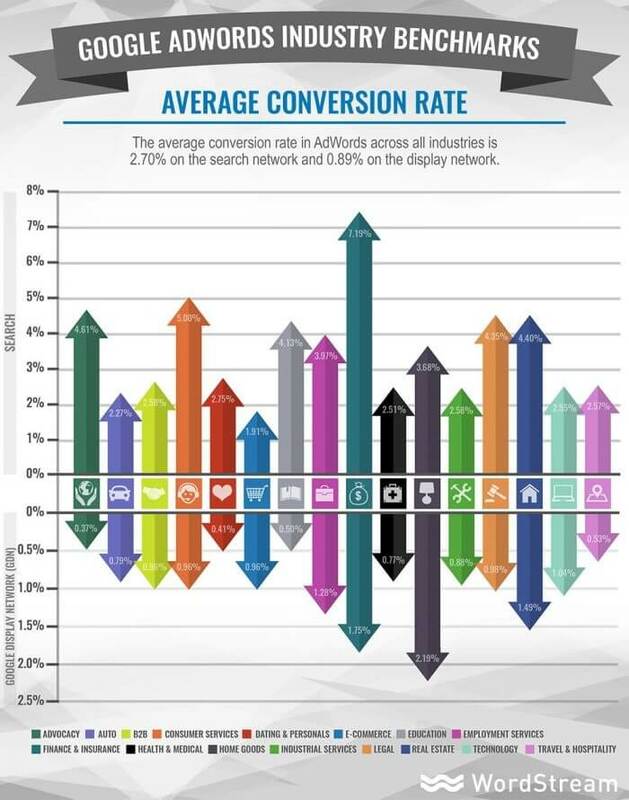 This information comes from an infographic released by paid search software provider WordStream. Their data, while released in September 2016, reflects conversions that took place in the second quarter of 2015. It is important to note that conversions don’t necessarily mean sales. These conversions could be any of the marketing funnel goals that you’ve set for your paid search campaigns. However, each goal converted is a hot lead acquired, and each hot lead is a potential sale with proper nurturing. Now that you know that real estate PPC works, what kind of strategy should you be looking at? There are three main platforms you should be creating a streamlined strategy for to ensure you reach today’s multiplatform, multiscreen audience efficiently. These are your traditional desktop search text and display ads that you see on search engines like Google and Bing. AdWords still tops the list of digital marketing channels that businesses are going to invest in, and with the success rate that the real estate industry is experiencing with AdWords, now is the perfect time to optimize your PPC strategy. In recent years, digital marketing has shifted from a desktop-first mindset to a mobile-first mindset. This comes with the increasing prevalence of mobile use among users from different age groups and demographics. The 2016-2017 State of PPC report shows that mobile is #2 among the digital marketing channels that businesses will spend on. With the real estate market being as competitive as it is, developing a paid ad strategy targeted to mobile users ensures you capture the mobile market and maximize your visibility. Social media platforms offer promoted or sponsored posts as an option for businesses who want to increase their visibility. It’s also the perfect platform to push content to a targeted audience, whether it’s a feature article on your development, your website itself, or a brochure or pricing table. A carefully planned social media strategy increases your audience, builds on interactions, and maximizes these paid post options to deliver the content that you want to a more focused audience. Paid ads are proven effective for promoting real estate businesses, with text ad search results garnering higher conversion rates than display ads. Companies are looking to invest in paid ads in the next 12 months. If you don’t want to be left behind, you better start looking at this marketing initiative and consider its benefits for your business. A multichannel approach is recommended to ensure the widest coverage and maximum market reach. Despite the differences in these channels and the way you deliver content through these channels, your strategy should be streamlined with consistent messaging and special attention to your target audience’s needs, as well as your conversion goals for each campaign you launch, in order to successfully improve your conversion rates. We at Truelogic will be happy to guide you through the development and implementation of your real estate PPC campaign. Get in touch with us today, and let’s discuss the best PPC strategy for your digital marketing needs. https://www.truelogic.com.ph/wp-content/uploads/2017/11/How-Effective-is-PPC-for-Real-Estate.png 183 380 The Content Team https://www.truelogic.com.ph/wp-content/uploads/2018/03/Truelogic-Logo-Colored.png The Content Team2017-11-03 21:17:142017-11-07 14:52:22How Effective is Real Estate PPC?